Word 2007 makes it easy to build your own document template, by basing it on an existing document. This means that you don’t have to re-create the same document and the same formats over and over again. Remember that the template needs to contain only the styles you need for that document, plus any text that is common to all documents. Only include the text that stays the same; other text is added when the user opens the template to create a new document. Find a document that has styles, formats, or text that you plan on using often. Save the original document to disk one last time, just to be sure. Strip out all the text and graphics that you don’t want in the template. Keep the text and graphics that you plan on using over and over, and edit the header and footer so that they contain only the items you plan to use repeatedly. Choose the Save As command from the Office Button menu. The name goes into the File Name box. Be descriptive. From the Save As Type drop-down list, choose Word Template (*.dotx). The document must be saved as a document template. 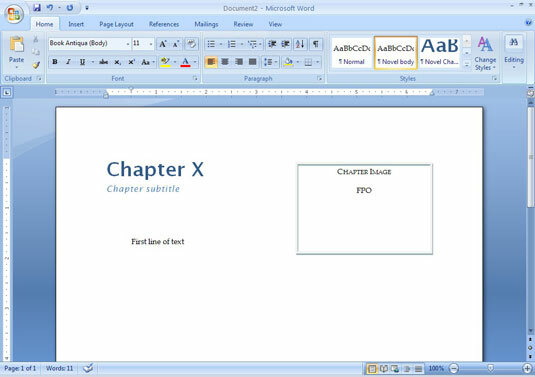 Choosing this format directs Word to save the document as a template in Word’s special Templates folder. Your efforts are saved to disk as a document template. Choose the Close command from the Office Button menu. The reason for closing the file is that any changes you make from now on are made to the template. 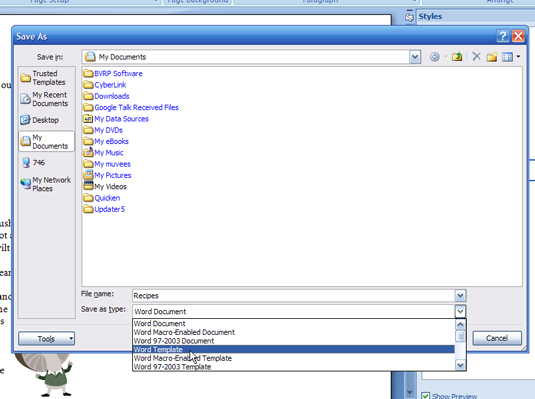 If you want to use the template to start a new document, you need to choose that template from the New Document window.